The 2018 edition of the 9.7-inch iPad is identical to the 2017 edition of the 9.7-inch iPad in terms of weight and dimensions. The difference is only in the internal functioning that is to say the software. The new iPad 9.7 inch 2018 edition now supports the Apple Pencil and allows you to draw or write using it. So, Apple Pencil is no more a privileged accessory for iPad Pro editions. 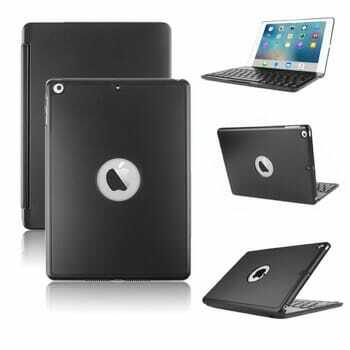 You can use it with one of the lowest cost models of iPad also. 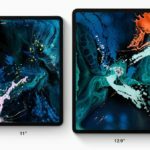 So, if you have got a new iPad and looking for the best cases for 9.7-inch iPad 2018 edition, the suggestions will almost be identical to those of its predecessor. The only difference is if you are looking for a case which can store Apple Pencil along with your iPad. 2017 iPad edition does not support Apple Pencil, so there weren’t many cases which supports that. The 6th generation iPad has a variety of cases available each of them having a unique design as well as a utility to add to the multitude of features of the device itself. But sometimes its just too difficult to choose which one is best suited for the iPad and has sufficient longevity and also serves our purpose. 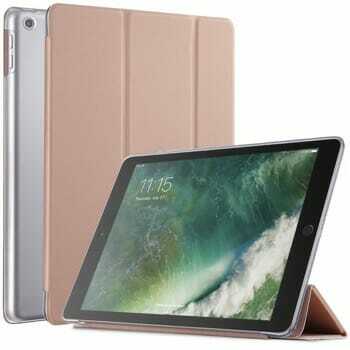 So here is a list of the top 10 best cases for 9.7 inch iPad 2018 / 2017 edition. This is one of the most compact multi-utility cases available which is manufactured by Apple itself and is available for purchase online on their official website. The case is lightweight, durable and keeps the back of your iPad open for show off maybe. It keeps the display screen clean due to a microfiber lining on the underside of the case that falls on the screen. Apple’s Smart Cover perfectly fits the dimensions and has a magnetically linked hinge that aligns the case perfectly. The case is folded at perfect positions to act as a stand for the iPad as well as a keyboard stand. The product comes in a variety of colors. This is definitely one the best cases for the 9.7-inch iPad. Apart from obviously protecting the iPad from immediate danger and direct impact this case has an additional feature of an actual keyboard. The display is completely protected from any sort of scratches or a hard impact. It completely covers the device and the keyboard connects to the iPad using Bluetooth LE. The case is powered by 2 replaceable coin cell batteries which spare you from the wastage of time or worry to charge it every now and then. It has a battery life of up to 4 years. The keyboard is specially designed for operating in iOS. There area series of hotkeys and shortcut keys that eliminate the need to touch the iPad screen frequently. 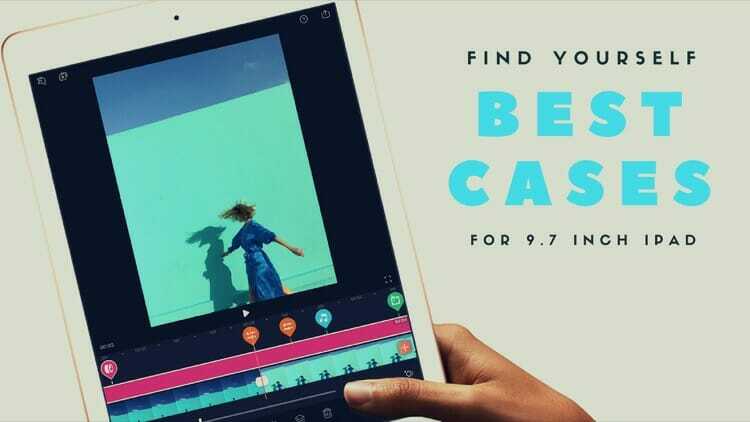 It definitely ranks second in the list of best cases for 9.7 inch iPad (2018). 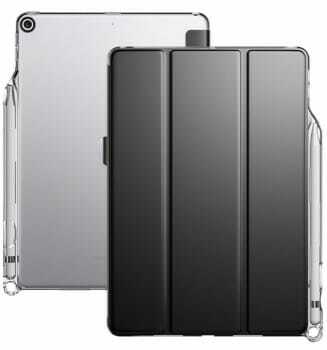 This is the simplest and obviously the cheapest case of protecting the iPad. It’s basically a transparent flexible cover that is attached to the back of the device. The casing is a sheath and hence there is nothing bulk that is added. The raised edges prevent contact with the screen and any surface. It also shows the color and the Apple logo completely with its transparent back. The best thing about this case is it comes with an Apple Pencil holder. So if you are planning to use your new iPad with Apple Pencil, you should buy this case. The back of this case is textured to facilitate good grip. As expected the cost is extremely nominal, around $20. This is a solution for all those iPad users who are looking for a heavy-duty case. It completely covers the device with a polycarbonate shell, even the earphone jack is protected. The display screen and the edges are protected from scratches and dust. The belt clip feature that comes with this casing is really of little or no use because it is not really recommendable to move around with your iPad on your waist. There are a variety of colors available in pink, black, blue, etc. It is the simplest iPad cover with 2 folding angles only – one for typing and the other suited for reading. The cover is magnetically attached to the edge of the screen with a perfect alignment. The magnetic front cover enables an automated screen lock system. You can choose from a variety of five colors as per your choice of hue. The camera lens in the back is protected from scratches and dust by raised edges all around. 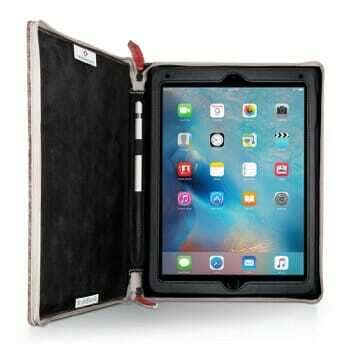 It is a stylish and fashionable zipper case that covers the entire iPad inside two hard leather covers to protect it from any sort of scratches and dust. When the iPad is inside the zipper case the protection is wholesome. 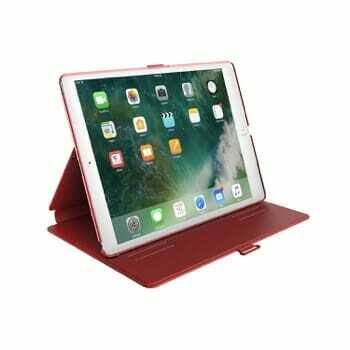 When the iPad is taken out from the case a built-in support frame can be used to align the device using the bendable support. You can also store your Apple Pencil along with iPad in this case. It disguises the iPad as a book so you can carry it safely without attracting too many eyes. The cost is relatively high in terms of the actual utility of the case and is $80. 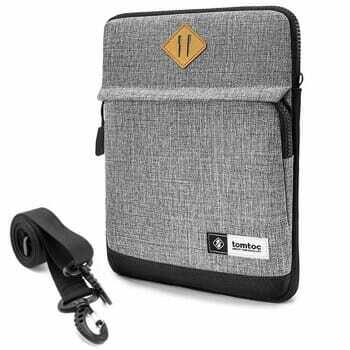 Tomtoc is clearly a winner when it comes to the iPad sleeve cases. It is very highly rated and also reviewed well. The 10.5-inch case is perfectly suited for the 9.7-inch iPad. It comes with 2 additional pockets apart from the main pocket that allows us to keep cables or even important papers. It has specially design Apple Pencil holder in the front pocket along with space for your Bluetooth keyboard. So you can carry all your accessories along with your iPad easily. A cushioning is given to the inside of the sleeve for shock absorption and the sleeve provides complete protection from dust and scratches. But unlike the cases that were discussed earlier, it cannot be used for a portable support system. You can carry your iPad including any case which is on the iPad in this sleeve. 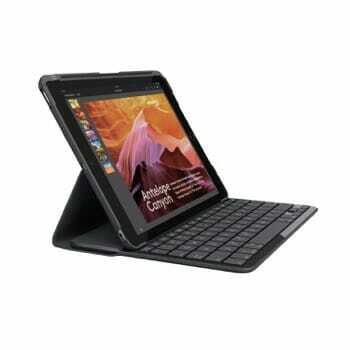 This a keyboard casing that turns your iPad into a laptop, a powerful one anytime anywhere. It provides an actual keyboard experience and also shortcuts for major iOS functions. The keyboard is also backlit one. 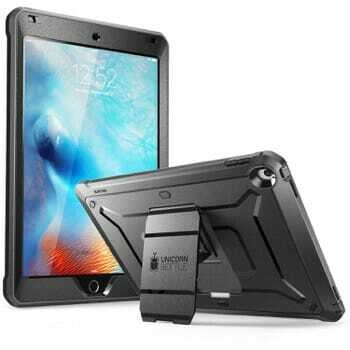 The case has a folding angle of up to 135 degrees to facilitate comfortable viewing angle. Slim and lightweight, this case has been the Amazon choice for a long time period. The only drawback here is that it does not have space for your Apple Pencil, so you need to carry it separately. This is just like any other trifold case cover, the only difference being that Poetic has made it transparent. So, the look of the iPad is always visible. It offers all-around protection. The folds offer standing positions for the device for various purposes. The front comes with premium PU leather build where the back is transparent hard polycarbonate material. It has an auto sleep & wake function with the help of magnetic closure. You can use the trifold to put it in multiple viewing positions. There are a lot of colors available and the price is quite low, amounting to just $6.99 on Amazon. This case converts the iPad into a convertible laptop with actual keyboard facilities. It has a backlit keyboard which is backed by 7 color backlights. 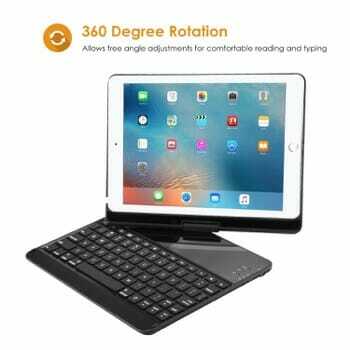 The case provides all-around protection with the additional feature of a fully flexible 360-degrees rotation keyboard casing. If you are planning to use the iPad for more of emails and office work, this is a good choice of case. 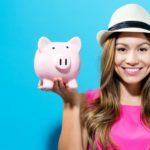 You will be able to easily place it anywhere and get your work done quickly. I always prefer cases with the keyboard as they make it easy to get my work done on the go. 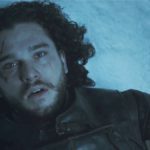 The case also supports wake and sleep function. Black casing is only available. The Amazon price is $46.99. 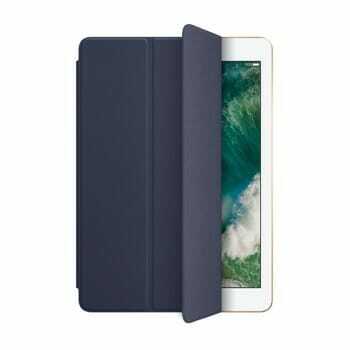 It is important to protect your iPad which is an extremely useful and valuable and for that a good casing is always required. Hope this guide helps you with your choice and you can find a good case to protect your new iPad.